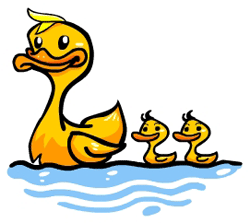 The adorable duck cartoon drawing showing a mother duck taking her two little ducklings out in the water is a lot of fun to make and quite easy if you just follow along with the steps below. Make a circle for the head and below that draw another oval-for the body of the mother duck. That's it for the first step. Move on to the next step. Join the circle with the oval by drawing two curving lines - both of them curving in the opposite direction, so that the graceful neck of the duck comes in shape. Add a little triangular shape at the top of the head circle to give shape to the head. Here you'll make a little lock of hair like shape at the top of the head circle of the duck. Then draw a small circle at the lower side edge of the head circle and a similar sized circle towards the other inside edge of the head circle. Join them with the shape like given in the example-so that the shape of the beak is made. A curving triangle at the other end of the body oval takes care of the shape of the tail of the duck cartoon. Little jagged edges just below the area where the neck of the duck meets the body will give the appearance of some feathers. 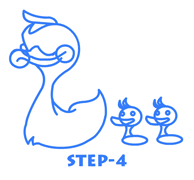 You'll also make the basic shape of the ducklings following behind their mother in this step - same thing like the first duck - one circle and one oval each for the two ducklings. 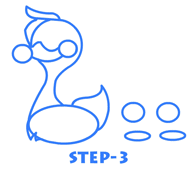 Next, erase the extra lines from the body of the duck so that it comes in clear focus. Then move towards the beak of the duck and make the other two curving lines to finish off the beak area. For the ducklings you should add two little tufts on top of their heads for the feathers. After that, draw little curved lines to join the head and the body and add little curved bean shapes for their small beaks. 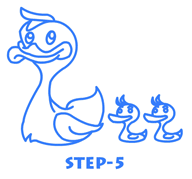 Now the ducklings have also taken shape and you're almost finished up this duck cartoon drawing. 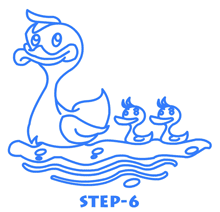 Erase all the extra lines in the duck's body and also add the wings, in the centre of the mother duck's body. You will also add the two ovals for the eyes with little circles in them. The eyes are made for the ducklings as well, and little tails and wings are also added. Little curved lines for the eyebrows of the ducklings are also to be made. Look closely at the example for this step to put all the parts in their rightful places. In this last step we make the curved lines and the smooth flow of the water to show that the mother duck is taking her little ones for a swim! 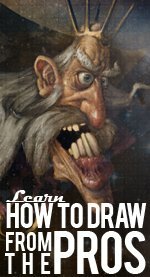 After that has been drawn your duck cartoon drawing is totally complete.